The Write Question is a weekly video podcast all about writing. Today’s question focuses on increasing blog traffic. If you have a question you’d like me to answer you can email me at daphne@publicationcoach.com, tweet me @pubcoach, or leave a message for me at the Skype account, The Write Question. 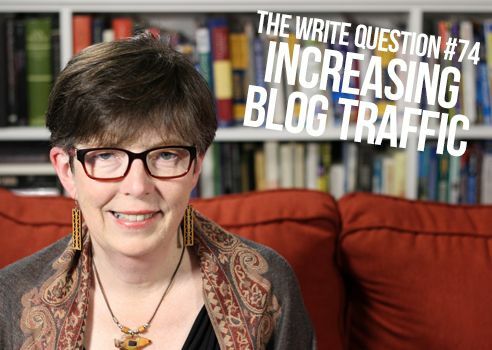 Welcome to The Write Question, I’m Daphne Gray-Grant and my topic today is driving traffic to your blog. I have a question from Fawzi Al Mussalam from the state of Kuwait. Here’s the very simple query he’s posed. Thanks for your question, Fawzi. While I’m happy to tell you what I do, let me emphasize that if you’re really serious about driving traffic to your blog, you should consult an SEO expert. SEO stands for Search Engine Optimization and what this means is doing everything you can to take people who are searching for something on Google and directing them to YOUR website. For example, if you google the phrase “publication coach” my website should be first on the list of links that Google produces for you. That might seem like a “well, duh” kind of effort, but it’s not as easy as it sounds. I’ve had friends and colleagues who’ve been unable to rank as first for the name of their own businesses! If that’s your kind of problem, then I encourage you to hire an SEO expert. I don’t understand or even know everything that my SEO guy has done to help me, but I know he’s made a big difference. I always leave the big stuff to him, but in terms of my day-to-day blog entries, I also spend some time trying to optimize them myself. One of the tricks I’ve learned is to use an SEO plugin to the back end of my WordPress site. This plugin is called YOAST and it’s free and super easy to use. I’ve provided a link below. For example, for this blog entry, I’m trying to rank for the phrase “increasing blog traffic.” I don’t imagine I’ll have huge success here because this is a pretty competitive subject area. AND the people who are experts in it have way more knowledge about SEO than I do! But I always like to try. So, here’s what I do. Using the Yoast plugin, I enter the words “increasing blog traffic” as my focus keyword phrase. I make sure I use the keyword phrase a couple of times in the blog. I try NOT to do this in a way that sounds forced or unnatural. I make sure my blog post is at least 300 words. This is the minimum length that Yoast recommends because that’s what Google wants. If possible, I use the keyword phrase in my URL. I seldom use the URL the system generates automatically. I try to use the keyword phrase in the first paragraph. I put the keyword phrase in the title and alt text tags for the photo accompanying my post. When I get a green traffic light, I know it’s okay to schedule my post. Use really good headlines. Here’s the mistake many people make: They write their headlines last, when they’re tired. Instead of doing that, try writing your headline first so that you’re able to apply all your creative energy into producing a really good one. Tell your audience what they most want to know. One of the ways I do that is by getting blog post ideas from my clients and from the comments section of my blog. Fawzi, if you’ll recall, that’s exactly where I found your question for THIS video. Do guest posts for OTHER blogs. I am a guest poster for several other sites including Visual Thesaurus dot com and The Measurement Standard dot com. I’m not paid anything for doing this work but I know it drives new readers to my own site. This is also why I tweet and post to LinkedIn. Make sure your website is compatible with all devices. Some people read my blog on their desktop computers, but many others read it on their phones or tablets. My blog is optimized so it will work on whatever device my readers are using. Use casual, everyday language and be sure to use the words “you” and “I.” You want your blog to feel informal and approachable and you want all your readers to think you’re writing specifically for them. This sounds like a lot of work, doesn’t it? Well, it is. But over time it becomes easier and more natural. And all of those new readers will also bring along some friends of theirs, so it becomes a self-sustaining mechanism. Thanks for the question, Fawzi. Driving more traffic to your website is a long-term project but it’s an extraordinarily useful goal. I hope my advice today helps you.